The wireless access point function can let your IEEE 802.11g/b wireless client devices access the Intranet through this router wirelessly. 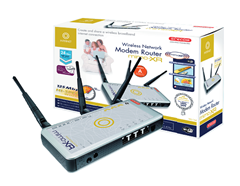 With the MIMO technology, this router enables you to spread the wireless networks at farther distances than before. The router has two antennas for signal reception and one antenna for high power signal transmission. Not only the connection distance is enhanced, but also the “dead spots” in the network will be reduced. Note: Please reset the router after upgrading!